Refraction. This test determines your eyeglass or contact lens prescription and we perform precise measurement in several different ways to determine the lens formula that will work best for you. Instruments used include computerized autorefractor, phoroptor and retinoscope, but an important part of prescribing lenses is for the doctor to understand how you use your eyes at work and leisure. Binocular vision testing. 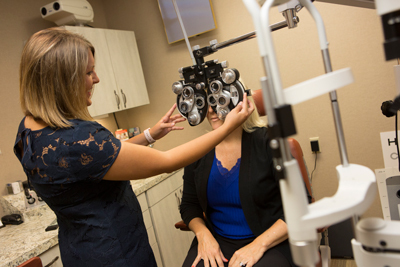 We test your eye coordination to be sure your vision is comfortable and that your eyes work well together. This includes an analysis of the eye muscles used for movement, focusing and depth perception. If you have a problem with binocularity, your doctor may correct it with prescription glasses or recommend vision therapy. Tonometry. This is one of several risk factors for glaucoma that we evaluate. It is a measure of the fluid pressure inside the eye. We offer a couple of ways to do this test: 1) a new generation of air puff test that is very gentle and quiet, 2) Goldmann tonometry, which is a device with a blue light that shines at the eye. Visual field test. Every comprehensive exam includes a screening of your peripheral vision with a computerized autoperimeter. You click a hand-held button when you see shimmering squares off to the side. It takes about 1.5 minutes per eye and it can help diagnose or rule out neurological disorders of the visual system. Optos retinal photography. The Optomap scanning laser takes a digital color photograph of the back of your eye. This test is recommended on a routine basis to provide your doctor with a baseline record of the appearance of your retina, internal blood vessels and optic nerve. It is also used to document diseases and anatomical abnormalities and monitor them over time. Macular Pigment Optical Density. MPOD is a measure of the risk for developing age-related macular degeneration (AMD), which is the leading cause of blindness in the United States. This screening test measures the density of pigment cells in the macula and it is recommended for all patients 18 and over. This test is evaluated along with 10 other AMD risk factors. Patients with a low macular pigment score may take nutritional supplements which will provide protection against macular degeneration and could even restore the pigment layer. Specular endothelial microscopy. A microscope magnifies the cells thousands of times and the image is captured with a camera. The reason for this exam is to monitor the number, density and quality of endothelial cells that line the back of the cornea. Healthy endothelial cells keep the cornea clear.